There are two stages of school education in the republic of Kazakhstan: primary education and secondary education. At the age of 7 Kazakh children go to school. During the first four years they get a primary education: they learn to read, write, count, and draw. They also have lessons of music, physical training and handicrafts. Unlike England or the USA, in our republic primary schools are not, as a rule, separated from secondary schools: we have large schools which combine a primary education department and a secondary education department under one roof. In fact, a typical Kazakh school is actually a secondary school with a primary education department. The course of secondary education is, in its turn, subdivided into two stages: the first stage, which might be called intermediate, and the second one. The intermediate stage is compulsory and embraces forms from the 5th up to the 9th. During the intermediate stage the pupils get a basic knowledge in the Russian/Kazakh language and literature, a foreign language, mathematics, physics, chemistry, history, geography, biology. They also have lessons of music, art and handicrafts. A computer course is also included in the curriculum. On completing the intermediate course of studies, at the age of 15, the pupils may either go to vocational or technical schools, which give a professional training, or stay on at the secondary school for another two years. The curriculum of the last two years offers a wide range of subjects, so that teenagers can choose a course of studies, according to their individual inclinations and abilities. A: Mr. Pavlov, I'd like you to explain to me some­thing which I don't understand. B: Yes, what is it, Mr. Brown? A: You say that yours is a secondary school, and I see a lot of little children running about the school yard. They are not older than 7 or 8. They cannot be pupils of a secondary school. B: Well, it's easily explained. You see, unlike En­gland and the USA, in our country primary schools are not, as a rule, separated from sec­ondary schools. A: So you combine a primary education department and a secondary education department under one roof, don't you? B: That's right. In fact, a typical Kazakh school is actually a secondary school with a primary edu­cation department. A: M-m, very interesting. Thank you, Mr. Pavlov. 1. What were you going to do after scho­ol? Was it your own decision? 2. Who helped you to make your deci­sion? 3. Have you tried to work in summer to find out what jobs you like most of all? 4. What professions are in demand nowadays? 5. What are advantages and disadvan­tages of your future profession/job? 6. Do you think you will succeed in your career? 7. Which abilities of your character would you like to develop? Why? 8. Those who chose their career cor­rectly are really happy, aren’t they? 10. Why did you decide to learn Eng­lish? what countries are they spoken? 12. Is your English good enough to travel as a tourist, to study abroad, to invite English-speaking guests? 13. Will you need English (or any other foreign languages) in your career? How will you study your next foreign language (at the university, by TV, abroad, etc.)? Ex 5What do you think about the statement? Ex 6Learn the following dialogue. A: What's wrong? Have you got a "two" again? B: Yes, in history. That's my weak point. It seems terribly difficult to me. The names, dates and events are all mixed up in my head. A: Is that why you were kept in? B: Yes. But the teacher didn't scold me — that was quite a surprise to me. She offered to help me after classes. A: I suppose your father will give you a good piece of his mind when he sees your bad marks. B: Yes, he will, and I deserve it! And brother will make a fuss, too. A: Let's do history together. Come over to my house tonight. If we work together, perhaps you will remember things better. You don't want to get another "two," do you? B: Of course not. I'll come at any time you say. A: It's high time to set to work. If you don't, you'll get “two” at the exam, and it will serve you right. Will you come at seven? B: Thanks, I will, by all means. I’ll tell my father this is my last “two” in history. So long! Skills are the activities that a person does well. What things are you good at doing? Everyone has many skills. Some­times it is difficult to recognize the skillsthat you have. Job skills are abilities you need for a specific job. For example, a chef needs to know how to cook and bake. A taxi driver needs to know how to drive a carand read signs. A secretary needs to know how to type and take messages. Transferable skills are skills you can use in many different jobs. You can take skills from one job and use them in a very different job. Speaking English well,for instance, is a skill you can use in almost any job. Some examples of trans­ferable skills are teaching other people, solving problems, accepting responsibil­ity, organizing projects, making deci­sions, and creating new ideas. Employ­ers want to select employees who have or who can learn the skills necessary to do the job. Task 1Read each sentence carefully. Choose the best word to fill in the blank. 2. Everyone ______ many skills. Have/has/is. 3. Sometimes it is difficult _________ the skills you have. To play/abilities/to rec­ognize/recognizes. 5._______ skills are skills you can use in many different jobs. Job/cooking/ transferable/babysitting. 6. An example of a transferable skill is ____ . Driving a taxi/writing well/playing the violin/cooking Chinese food. 7. An example of a job skill is_______ . Cooking pizza/working well with people/ accepting responsibility/organizing projects. 8. Employers want to select people who can learn the ____ necessary to do the job. Skills/books/idea/shining. • you have no time for a life from August to June. • when out in public you feel the urge to talk to strange children and correct their behavior. •you believe «extremely annoying» should have its own box on the report card. •you know hundred good reasons for being late. •you don’t want children of your own because there isn’t a name you can hear that wouldn’t elevate your blood pres­ sure. средняя школа, ученый, обучение в школе, учиться в школе, школа-интернат, принять в институт, рекомендация, стипендия. 1. Pre-school and primary education in the republic of Kazakhstan. 2. Secondary education in the republic of Kazakhstan. 3. Higher education in the republic of Kazakhstan. 4. Examinations in the republic of Kazakhstan. One of the students is supposed to play the role of an Englishman, who knows very little about schools in our country. He must ask questions to get some more information. Make list of advantages and disadvantages of educational system in our republic. Ex 11Read the following advertisements. Which of them offer educational services, which of them are advertisements with job offer? Imagine that you have become interested in all advertisements. What would be your reaction on them? London Keyboard Training Centre specializes in the training of modern office skills. Our patient and skilled instruc­tors run classes for absolute beginners (as well as refreshers) in Touch Typing (you learn the keyboard in the first hour), WordPerfect 6.1, WordPerfect for Win­dows 6.0, Lotus 1-2-3, Desktop Publish­ing, DOS, Data Entry and Audio Typ­ing. We also run combinations courses at specially reduced prices for those wish­ing to acquire more than one skill and offer guarantees on all our courses, al­lowing extra free time to those students who do not achieve their target typing speeds or competence in either courses. Business Administration courses are available. Our courses start daily, are flexible and are conducted throughout by qualified instructors (no self-teach packages are used) in a relaxed and fri­endly atmosphere in which students prog­ress at their own pace. We also provide secretarial services including the typing of CV’s letters, documents etc. Bored with weekly lessons? The answer — intensive training. Learn to drive and pass your test in 5-or-7 days with one to one tuition and your test included. Excellent pass rate. Accommodation available. Training on car, lorryor bus. For full details ring John’s School of Motoring. Personal Tuition only. No audio teach­ing methods. French, Italian, German, Spanish, Rus­sian and Japanese classes. Secretarial Diploma course starting 24th April. Leading International head-hunting company requires a receptionist who pos­sesses an excellent telephone manner, good typing skills and a flexible attitude. We are looking for someone with com­mitment to and interest in, projecting our company’s professional image and dynamic approach. Excellent package, lively environment and good career prospects. 35 King Street, Covent Garden, Lon­don, WC2E 8JD. 1. Don't teach a fish to swim. - He учи рыбу плавать. 2. Repetition is the mother of learning. – Повторение - мать учения. 3. Spare the rod and spoil the child. - Пожалеешь розгу -испортишь ребенка. 4. No pains — no gains. - Нет боли - нет успеха /т. е. не потрудишься -ничего не добьешься/. 5. Live and learn. - Живи и учись /ср. : "Век живи - век учись"/. 6. It is never too late to learn. - Учиться, никогда не поздно. 7. Knowledge is power. - Знание -- сила. 8. Money spent on the brain is never spent in vain. - Деньги, истраченные на мозг, никогда не бывают истрачены понапрасну. 9. One good head is better than a hundred strong hands. - Одна хорошая голова лучше сотни сильных рук. 10. The pen is mightier than the sword. - Перо могущест­веннее меча. 11. Too much knowledge makes the head bald. - Слишком много знаний приводят к облысению. 12. Zeal without knowledge is a runaway horse. - Рвение без знаний подобно лошади, сорвавшейся с поводка. Task 1Think up situations or short stories to illustrate each of the above proverbs and sayings. The lexical theme: Computerization of Kazakhstan. Task 1Translate the received word-combinations. Computers are getting deeper and deeper into our life. They are indispensable in space research, communication, medicine, metallurgy, light industry, information technology and many other branches of industry. Many countries have introduced computers into agriculture, education, transport and many other spheres. Computers provide security and safety of various processes, diagnose numerous cases and do a lot in monitoring different developments. In short they help to carry out increasingly complex tasks and their application sometimes helps to prevent disasters, tragedies and accidents. The managements of some American schools have found an original application for computers. Now teachers simply feed into the memory of the machine names of the absentees and it begins to phone their parents and warn that their children have missed lessons. The teachers and parents like the new system and only pupils fall out of favour with it. 1. Did you find the information of the newspaper rather curious? 2. Whose idea was it to use computers in this way? 3. Who liked and who disliked this idea? 4. And what is your attitude to this idea? 5. Could you offer a better idea? 1. What job does a programmer analyst do? b) He writes programmes for computers. a) Any programmer analyst has some knowledge of data communications. b) Any programmer analyst has hardware exposure. c) Any programmer analyst has o lot of computers at home. a) ____ of data processing. b) ____ in the debugging and coding of software programmes. Computer making industry is developing rapidly and new or improved and modified types of computers (____) as well as new programs (____) come into wide usage. The end users make this industry move forward all the time. The competition is very strong on the world market. Olympia, Germany, introduces its “people 16-bit professional microcomputer” that can serve as a personal computer to perform applications such as word and data processing, financial planning and modeling, database management and statistical analysts. It includes cpu with built-in disc drives, Intel microprocessor,128-512 kb memory, two floppy-disc drives with 1.3 mb capacity, and parallel and serial interfaces. Unit has 91-key, free-standing key-board that can be positioned for operator comfort that offers 12 programmable function keys. Non-glare 30.5 cm green display can be swiveled and tilted. Users can select anyone of the three operating systems. Graphic software is available. Colour monitor with eight-colour palette is optional. 1. Computer hardware and software are constantly improved. 2. The requirements of the buyers make the producers improve and modify the production. 3. There are many computers on the market. 1. What means of advertising computers and equipment are widely used? 2. What does the quoted ad popularize? 3. When do you think this ad was published? 4. What makes you think so? 5. In what newspaper do you think it was published? В соответствии с Государственной программой информатизации системы среднего образования завершена 100-процентная компьютери-зация общеобразовательных школ. Электронные учебные издания для организаций среднего общего образования охватывают 25% школьных предметов. К спутниковому каналу дистанционного обучения подключено 717 школ шести областей республики (8,7%). Вместе с тем развитие и применение информационных и коммуникационных технологий (далее – ИКТ) в сфере образования значительно отстают от потребности. В Казахстане на один компьютер приходится 54 учащихся общеобразовательных школ, что, по данным ЮНЕСКО, является одним из самых высоких показателей среди стран СНГ (в России – 59). На начало 2004 года в Великобритании в средних школах на 1 компьютер приходилось 5 учащихся, в США – 4. В настоящее время доступ к сети Интернет имеют только 44% школ Казахстана. В Финляндии уже в 1999 году более 90% школ имели выход в Интернет, в 2000 году – 100% школ Эстонии, более 80% школ Австралии, Канады, Исландии, 58% - Венгрии, 52% - в среднем по странам Организации экономического сотрудничества и развития. Лишь отдельные вузы внедрили технологию дистанционного обучения, в некоторых данная технология реализуется в эксперимен-тальном режиме. phone calls, specialists, money, e-mail messages, China, users, over the Internet. The Internet, a global computer network which embraces millions of users all over the world, began in the United States in 1969 as a military experiment. It was designed to survive a nuclear war. Information sent over the Internet takes the shortest path available from one computer to another. Because of this, any two computers on the Internet will be able to stay in touch with each other as long as there is a single route between them. Owing to this technology, if some computers on the network are knocked out (by a nuclear explosion, for example), information will just route around them. Most of the Internet host computers (more than 50 %) are in the United States, while the rest are located in more than 100 other countries. Although the number of host computers can be counted fairly accurately, nobody knows exactly how many people use the Internet, there are millions worldwide, and their number is growing by thousands each month. The most popular Internet service is e-mail. Most of the people, who have access to the Internet, use the network only for sending and receiving e0mail messages. However, other popular services are available on the Internet: reading News, using the World-wide Web. Commercial users can communicate cheaply over the Internet with the rest of the world. When they send _____ , they only have to pay for _____ to their local service providers, not for calls across their countries or around the world. But who actually pays for sending e-mail messages _____ long distances, around the world? The answer is very simple: _____ pay their service provider a monthly or hourly fee. Part of this fee goes towards its costs to connect to a larger service provider, and part of the fee received by the larger provider goes to cover its cost of running a worldwide network of wires and wireless stations. But saving _____ is only the first step. If people see that they can make money from the Internet, commercial use of this network will drastically increase. For example, some western architecture companies and garment centers already transmit their basic designs and concepts over the Internet into _____ , where they are reworked and refined by skilled – but inexpensive – Chinese computer-aided-design _____ . However, some problems remain. The most important is security. When you send an e-mail message to somebody, this message can travel through many different networks and computers. The data is constantly being directed towards its destination by special comput­ers called routers. However, because of this, it is possible to get into any of the computers along the route, intercept and even change the data being sent over the Internet. In spite of the fact that there are many good encoding programs available, nearly all the information being sent over the Internet is transmitted without any form of encod­ing, i.e. “in the clear”. But when it becomes necessary to send important information over the network, these encoding programs may be useful. Some American banks and companies even conduct transac­tions over the Internet. However, there are still both commercial and technical problems which will take time to be resolved. 2. What was the Internet originally designed for? 3. What country are most of the Internet host computers in? 4. What is the most popular Internet service? 5. Why do businessmen prefer to send e-mail messages, but not to call their partners? 6. Who actually pays for sending e-mail messages over the Internet long distances, around the world? 7. What does this fee cover? 8. Why may commercial use of the network increase? 9. What is the most important problem of sending e-mail messages? 10. What can happen to e-mail message while it is traveling through many different networks and computers? 11. How are special computers called, which direct the data towards its destination? 12. Is all the information transmitted over the Internet without any form of encoding or not? 13. When does it become necessary to send encoding information? 1. Do you use resources of the Internet? What for? 2. Do you have any possibilities to use the Internet at your university? 3. Is the time of using the Internet limited? 1. … because there is much information in Internet, and we can use it. 2. 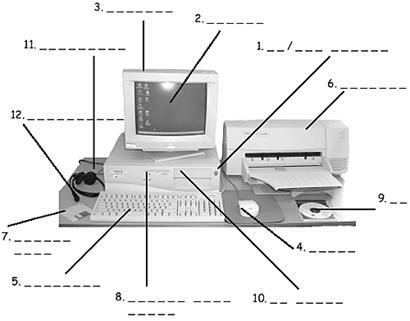 Computer is indispensable in many branches of industry. 3. Owing to computers, we can do our work more quickly. 4. Space research is impossible without computers. 5. … because computers provide security and safety of different processes. 6. … because computers can help us to carry out complex tasks. 7. Computers can help to prevent disasters, tragedies and accidents. 8. Computers can provide you a well-paid job if you have high degree of computer literacy. The lexical theme: Sport. Sport in Kazakhstan. Cricket, basketball, soccer, rugby, volleyball, tennis, baiga (the horse races), golf, wind-surfing, skate-boarding, table tennis, badminton, triathlon (includes swimming, bicycle racing, long-distance-running), zhamby (the low shooting), snooker, audazyspak (the wrestling on the horses). Jane: Say, there is Joe. You know him, don’t you? Jack: Everyone on the campus knows him. He was quite a hero during football season. Jane: By the way, he’s also a straight A student. That’s an unusual combinati­on for a football player, don’t you think? Jack: I should say so. How does he find enough time? Jane: That reminds me. Did you get your history paper finished on time? Jack: Oh, yes. I turned it in this mor­ning. It wasn’t very good though, I’m afraid. I’ll be lucky to get а С on it. Jane: It’ll serve you right. Next time you won’t wait till the last minute. Peter: Hello, Sam. Nice to hear you. How’s everything? Sam: Fine, thank you. You know, this Friday our team is playing against your Red Sox. Peter: Are they really? That’s great! They are my favorite teams and I don’t know who to root for. Sam: I have two tickets. Would you like to watch the match? Peter: Sure thing. This is the only chance, and I would not miss it. And what’s your favorite sport? Sam: It’s hard to say. I like soccer all right, but I think I like tennis better. Peter: Do you play much tennis, Sam? Sam: Yes, quite a bit. How about a game sometime? Peter: No, thanks I am strictly a spec­tator. Sam: So I’m sending you the tickets for the match and hope to see you soon. Sam: I’m looking forward to seeing you. Good-bye. Ex 3Using the material of the given texts, make up 5 dialogues on the theme “Water sports” and “Winter sports”. Water sports include: swimming, div­ing, water polo, sailing and motor boating. For those interested in motor boating, sailing or rowing are special yacht clubs and rowing stations where members can learn the sailing art, become qualified sportsmen participate in inter-club com­petitions. Swimming, diving and water polo are very widespread. During winter months in big cities swimmers practice swimming, diving and playing water polo in closed swimming-pools. Many interesting contests are held both in summer and during the cold win­ter months. Lately there have been many new open swimming-pools erected with heated water, where swimmers can prac­tice all the year round. Water polo is an interesting game some­what like handball only played in water. The players pass the ball between themselves until they are within shooting range of the opponents’ goal. Then they try to throw the ball into the goal which is defended by a goalkeeper. To be a good diver one must not only know how to swim well, he must be a good acrobat also. He must be able to regulate his mo­vements and time them exactly in order to be able to do some turns or summer­saults in a few metres bet­ween the spring-board and the water’s surface and mainly to enter the water head-first without splashing. It takes enormous practice and patience to become a good diver. Swimmers are most numerous of co­urse and so are the events in which they participate. These are races from 100 metres up and various styles too. For in­stance, crawl free-style, breast-stroke, but­terfly, back-stroke, dolphin, side-stroke. All these strokes are classified indepen­dently. There are relay races for both men and women. Some swimmers like distance swim­ming or underwater swimming. Many sportsmen have already swum across the English Channel. Attempts have been made to swim across the Atlantic Ocean but so far in vain. Under-water swimming and diving has become very popular lately especially sin­ce the aqualung has been popularized. Many under-water swimmers go in for under-water hunting now, others explore the sea bottom to learn more about under­water life. As yet this is not a classified sport. The youngest swimming teams in the last World Championships were the Aust­ralian and the American. They were averagely 14 years old and they were the best too. They won first places and established many new world records. Now there are very many young swimmers (schoolchild­ren) in Holland, Japan, England, Russia and other countries. Almost all the world records have been broken by them. They are not only speed swimmers but long­-distance swimmers also. Swimming and rowing are of the sport events for one’s health. They develop wide chest expansion, large lung capacity and flexible muscles. Usually when talking about winter sports we have in mind all sports having to do with ice and snow. But some ice sports such as hockey and figure skating should be considered summer sports too, or at least all-season sports. They are played the world over on artificial ice-rinks. There are some winter sports such as tobogganing and bob-sleighing not culti­vated in Russia and others cultivated here but not in other countries. The main winter sports are: skating, skiing, ski-jumping, hockey and figure skating. Ski-running is an event that has prac­tically no viewers. Usually only the referees and officials see the skiers off (start) and wait for them to return in an hour, two or three (depending on the distance), not being able to see the skiers, the race, etc. because they are far away in the wo­ods while the officials have to stay at the finish line. It’s ever so sorrowful that such interesting races cannot be watched by the fans. Ice skating is now universally develo­ped. In the hottest countries there are artificial ice-rinks, although in the deep south roller skating is more common. It is as interesting to watch speed races as it is to participate in them. The track is 400 metres in circumference like the running track. The distances for men are: 500, 1500, 5000 and 10,000 metres. For women they are: 500, 1000, 3000 and 5000 metres. Hockey, called sometimes «Canadian hockey» or «ice hockey» is played on a rink 40 metres long by six players. It is a very interesting, fast and dynamic ga­me. It is played with a puck and long straight sticks with an angle at the bot­tom. The puck, which is made of hard rubber, is passed between the players un­til it is thrown into the opponent’s goal. The team, that scores the most goals wins. The game lasts for 60 minutes: three peri­ods with two ten-minute rests between the periods. During the last few years our hockey teams have developed into «world class» and have more than once won the world championship. Russian hockey is called «ice football» because it is played on an ice football field 100 metres long. There are 11 play­ers in each team and they play with a round ball (the size of a tennis ball) and short curved sticks. The playing time and rules are similar to football. Figure skating has won during the last few years the hearts of millions. Altho­ugh most of the people have never seen figure skating at the rinks, they havesat for hours watching European, world and other championships over TV. It is needless to say that figure skating is a most fascinating and graceful sport. While watching one never thinks of the years of hard training it takes to accomp­lish this fine art, of the tremendous work on smoothing out slight flaws, of the developing of a «musical ear» (feeling of rhythm), the grace of ballet and the agile of acrobatics. This sport is becoming one of the most popular in our country now. Many special sport schools of figure skating have been opened, the results of which are already obvious. There are still more well-known and popular winter sports, some of which are now included into the Winter Olympic Games and others that are gradually beco­ming international. Ski-jumping is a very exciting sport. A long smooth hill is chosen for a course. About one third of the distance down, an elevation of two metres called the hopis built and covered with snow. The jum­per starts and when the hop is reached straightens up and sails through the air, touching the ground again several metres from the bottom of the hill. The skill consists in retaining the standing posi­tion and continuing the run down the hill. swimming, skating, div­ing, water polo, ski-jumping, figure skating, sailing, skiing, motor boating, hockey. d) the Australian and the Kazakh. 4. Water polo is a game some­what like … only played in water. 6. What is the name of Russian hockey? 7. What is important in swimming? 8. Which of these games lasts for 60 minutes (three peri­ods with two ten-minute rests between the periods)? 11. … is an event that has prac­tically no viewers. 13. The best age for international swimming is considered to be ..
d) from 9 to 16 years. A tramp was sleeping behind the bun­ker of a golf course when the club secre­tary, prowling around, kicked him none too gently and ordered him to clear out. «And who are you? » demanded the tramp. «I’m secretary of the club, » said the official. They arrived at the fifth inning. «What’s the score, Jim?» he asked a fan. «Nothing to nothing,» was the reply. The champion athlete in bed with a cold was told that he had a temperature. «How high is it, Doctor?» he wanted to know.